We didn’t get much relief from the north wind. It was nice yesterday, but it started blowing from the north last night and by the time our trip ended the Lake was rough. 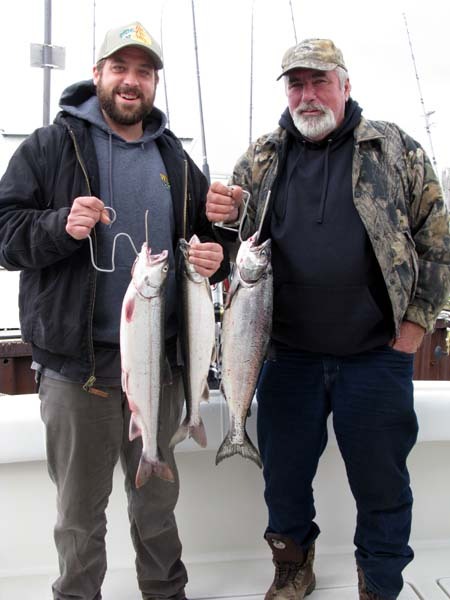 We took a couple fish early, a Steelhead on a low wire diver out 70 with a regular size Green Glow spoon, and a Laker on a 3 color core with a Super Slim Green Jeans. After that it was slow going. We trolled for a long time without a bite and finally pulled lines in the 53’s south and 35’s west and ran back north and out. We took three Steelhead out there on the 40 west line. All three fish came on Super Slim Steelie Stompers. One on a 3 color core, another on a 2 color and the last on a 1 color core. All our fish but one came in 50 degree surface temp water. The other one came in 52 degree water. We don’t have another trip scheduled for a while and we are hoping for a few days of calm water. After our tough day yesterday I advised our clients today to cancel or reschedule their trip. 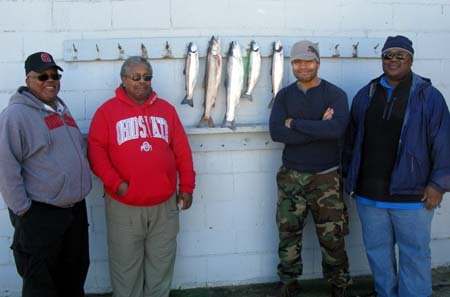 They said they still wanted to go so off we went this morning heading west southwest out of Ludington. We shut down when the surface temp reached 48 degrees and started trolling southwest. We were in the 44’s west. It was cold this morning and it was rough, but not as rough as yesterday. We hit our first fish on a regular size Green Glow spoon on a Slide Diver out 135 with a 50 ft. lead in 50 degree water on the 45 line. We kept going southwest until the surface temp was 52 degrees and had no more bites. We turned back east and when we hit 50 degrees we hit a fish on an out down with a pair of regular size DW Green Skinny Jeans. We missed it. We stayed pretty much on the 45 line the rest of the trip. We took a Laker on a low wire diver out 140 with a Super Slim Flea For All and another Lake Trout on an out down set at 52 with a SS Steelie Stomper. We didn’t mark any bait out there but we did mark fish and once the Lake calms down the fishing should get better. Deposits mailed to: 6888 Illinois Rd. We're docked at Lake Street Marina 800 S. Washington Ave. Ludington, MI 49431.